Pak Talks Comics: All Rom, All the Time! Greg Pak’s latest “Pak Talks Comics” column has been posted at BrokenFrontier.com. Today’s subject is the “Spacenight: A Tribute to Bill Mantlo” event at Floating World Comics on December 6 in Portland, Oregon, which features over a hundred original drawings of Rom by artists from around the world. 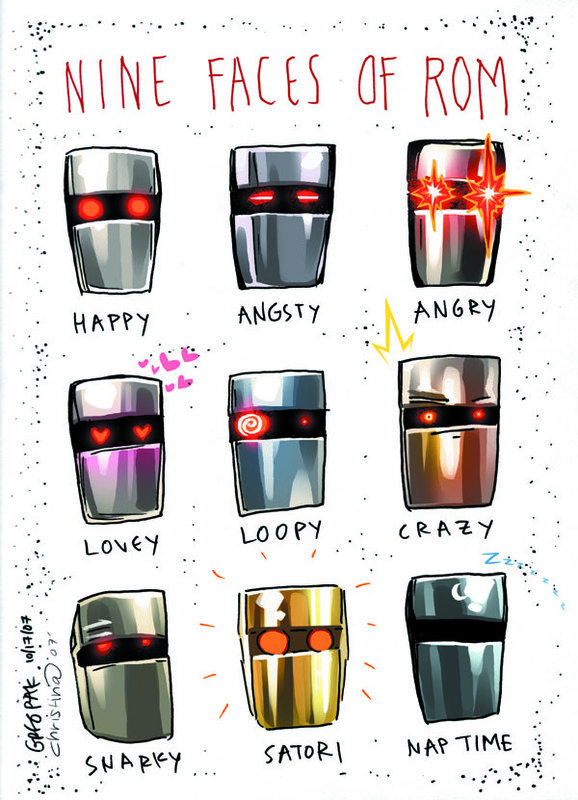 Pak’s interview with organizer Jason Leivian about Mantlo, Rom, and the benefit includes sneak peeks of some of the art — including Pak’s own “Nine Faces of Rom” drawing, colored by the brilliant Christina Strain. Click here for the higher-res version of the Pak/Strain Rom drawing. Comments Off on Pak Talks Comics: All Rom, All the Time! ComicBookResources.com has posted a six page, colored, lettered preview of “World War Hulk: Aftersmash,” a one-shot special written by Greg Pak with pencils by Rafa Sandoval. The story follows a number of characters, including Hercules, Amadeus Cho, Misty Knight, Tom Foster, and the Warbound, as they struggle to survive in the wake of “World War Hulk.” The book hits comic book stores on December 5. Click here to view the pages. It’s a good sign, too, that the new/old book will be worth checking out, as everything here is pretty Good; Cho’s pretty much been the breakout star of the World War Hulk event for me, and his interplay with the dumb but well-meaning Hercules is entertaining enough for me to want to see more. With “new/old book,” McMillan’s referring to the fact that with issue #112, “Incredible Hulk” gets turned over to Hercules and Amadeus Cho for a storyline written by Greg Pak and Fred Van Lente — the book gets officially renamed “Incredible Hercules” starting with issue #113. Click here for the skinny about the new book. And click here for the full Savage Critics review of #111. More “Incredible Hercules” preview pages! Marvel Comics has released four gorgeous preview pages from “Incredible Hulk” #112, which hits comic book stores on December 19. Written by Greg Pak and Fred Van Lente with pencils by Khoi Pham, this is the beginning of the “Incredible Hercules” storyline, in which the Greek god takes on S.H.I.E.L.D. with the help of incorrigible teen genius Amadeus Cho. Click here to read the press release and view the pages. Comments Off on More “Incredible Hercules” preview pages! Why him? How do you reinvigorate the Incredible Hulk saga? Send him into orbit and make him the new “messiah” for a bloodthirsty planet populated by aliens struggling to overcome a caste system. Pak, who also makes movies, has pulled off one of the most exciting story lines Marvel has produced. Must-read: Marvel’s “Planet Hulk” will set you back $39.99, but it’s worth every penny, turning out to be one of my best reading experiences this year. NRAMA: As for Herc, heâ€™s always been a fun-loving guy, and his minis in the day were pretty funny. On the other hand, there was also a Hercules-as-alcoholic storyline a few years back as well. What’s the tone here, and how much do you feel you need to balance those aspects? Pak: As S.H.I.E.L.D. commander Gabe Jones says in the first issue of Incredible Herc, Hercules always goes with his gut. Alas, Gabe goes on to point out, â€œhis gut is really, really dumb.â€ Thatâ€™s part of the enormous charm of the character — heâ€™s a creature of emotion and instinct who always does what he thinks is right but ends up in enormous amounts of trouble as a result. Combine that with Amadeus Cho, whoâ€™s exponentially smarter than Herc on one level but maybe even dumber when it comes to making all the wrong decisions, and youâ€™ve got a great recipe for ongoing disaster. Which is solid gold for us a storytellers — it allows us to tell stories with tons of action, plenty of humor, and some surprisingly deep explorations of emotion and friendship and morality. Tone-wise, Iâ€™m shooting for the action adventure feel of some of my favorite movies. Jaws and Aliens are first and foremost tremendous action pictures, but theyâ€™re beautifully built character pieces and packed with laughs at the same time. Youâ€™ll laugh, youâ€™ll scream, and you might even eventually nod with sad understanding of the tragedy that is life. And Herc will smash. Whatâ€™s not to love? Van Lente: When youâ€™re talking about Hercules, you canâ€™t not talk about this rich mythological tradition he comes from, which is filled with intense battles with giant scary monsters (something else the Hulk comic has in common with him) but also a lot of human fallibility and tragedy. I think whatâ€™s been missing from some past interpretations of Herc is that people tend to a focus a little too much on fallibility without enough enormous Ray Harryhausen-type spectacle. (Nigel Green in Jason and the Argonauts: Greatest. Movie. Herc. Ever.) Greg and I are having massive battles in both the modern-day post-World War Hulk time period and in ancient Greece, but whatâ€™s fun is we never lose sight of the real emotion thatâ€™s driving them. Thatâ€™s whatâ€™s made Incredible Herc tons of fun to write â€“ and, we hope, read. I thought this was really a successful example on how to sandwich your chapters of a crossover in between the main book…. You get an exciting story, thereâ€™s tons going on, itâ€™s packed with some funny scenes and these renegade heroesâ€”Angel, Namora, Hercules and Amadeus Choâ€”arenâ€™t just watching Sentry fight the Hulk. Thereâ€™s a lot going on here that stands on its own. Creators could take a lesson from this storyline on how to put together a crossover. “Planet Hulk” turned the big green behemoth from a ragin monster into a deeply complex and psychologically driven character. And with “World War Hulk,” Pak proved his ability to deliver complex, heartfelt storytelling and intense scenes of action on the grand stage of company-wide crossovers. The full article can be found in “Wizard” #195, on sale today in comic book stores everywhere. “Incredible Hulk” #111, written by Greg Pak and Jeff Parker with pencils by Leonard Kirk, hits comic book stores on November 21. Click here for a six page preview of the issue. While the action is great and would make a tremendous popcorn flick if ever put on screen, the reason this series and the finale in particular resonate so much with readers is thanks to writer Greg Pak, who’s created character-driven battles, not mindless slugfests. Whether with a punch or a word, there is raw emotion and angst on display here. Especially for the mildly shocking reveal, followed up by a development a bit more surprising and then a shocking last page.